The project, called The Enemy, is showing as a part of the Tel Aviv International Student Film Festival until Saturday and is the brainchild of veteran war photographer Karim Ben Khelifa. In Tel-Aviv on Sunday, Gilad, a broad-shouldered IDF reservist, and Abu Khalid, a skinny masked fighter for the Popular Front for the Liberation of Palestine (PFLP), stood facing each other in a room. They are sworn enemies. However, in Tel Aviv they calmly told their stories and answered a series of questions. “What is violence? Who is your enemy? Have you killed your enemy? What is peace to you?” the combatants were asked. Both Gilad and Abu Khaled answer, maintaining continual eye contact amid a group of curious onlookers. This scene may seem a bit unreal, and that is because it is, at least partially. 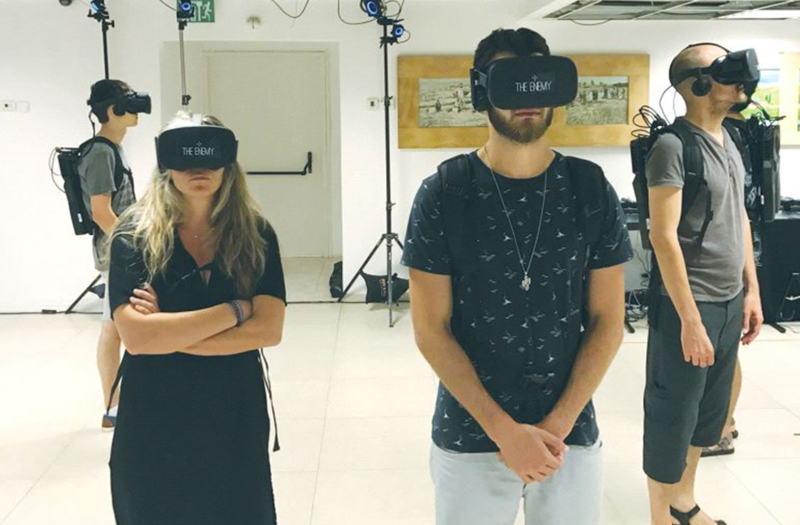 While Gilad and Abu Khaled are real people who give real answers, they are viewed through a hyper-realistic virtual-reality headset that projects 3D animation of the Israeli and Palestinian men that is then interwoven with prerecorded interviews. The project, called The Enemy, is showing as a part of the Tel Aviv International Student Film Festival until Saturday and is the brainchild of veteran war photographer Karim Ben Khelifa. Along with the Israeli-Palestinian component, Khelifa interviewed two rival gang members in El Salvador, and combatants from the Democratic Republic of Congo. The purpose, according to Khelifa, is for the audience to think differently about polarized conflicts by encountering humanity on both sides. “In conflict and areas like this, especially here, there is less interaction between the two people. And the less you have interaction the more the narrative of dehumanization is taking place because there is nothing to counter it,” said Khelifa. But the photographer did have some trouble with the IDF, which refused to offer an active duty soldier to participate in the project alongside the PFLP, a designated terrorist organization by Israel, the United States, the European Union. The project began from a sense of frustration. After years of working in conflict zones like Iraq, Afghanistan, the Congo and elsewhere, Khelifa felt his photos had little impact on the people being photographed. Viewers of the installation are taken through three separate virtual rooms where they encounter the combatants.There is Jean de Dieu, a member of the Democratic Forces for the Liberation of Congo, who said he has not felt joy since he was a child.A shirtless and tattooed Amilclar Vladamir, of the Barrio 18 Gang in El Salvador, hopes he can give his kids a life different than his.Gilad and Abu Khaled both share similar aspirations, they hope for peace and an end to conflict and their personal stories allows the viewer to empathize with both parties. The project intentionally skirts the details of the Israeli-Palestinian conflict, which often force people to take sides, instead of seeking to highlight humanity. Following the project, Gilad and Abu Khaled even had the chance to meet the other’s hologram. Their initial reactions were highly skeptical and it’s unclear what would happen if they actually met in person, but the fighters still support the project.